Cotton Plant, Flowers, Bolls, Leaves used in Ayurveda as antidote to bites of Rats, Scorpions, for curing Burn Wounds, Joint Pains, Mumps, Bacteria in Teeth, Swollen Legs etc. Cotton has been cultivated by man since time immemorial. It is main natural fiber used for clothing. 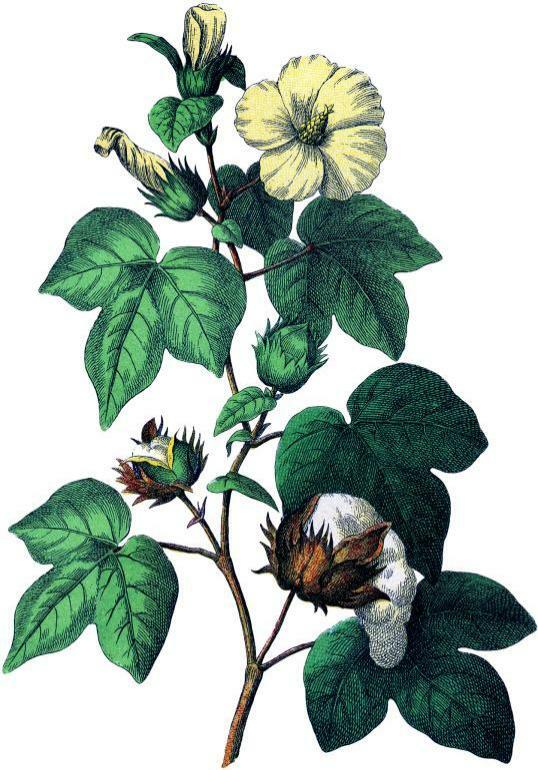 The botanical name of cotton is Gossypium and primarily found in tropical and sub tropical areas. Cotton is a shrub having broad leaves and having a “Boll” which contains seeds surrounded by fiber. Cotton is sweet in taste and cools the body. It’s proper usage reduce over heat, thirst, strain and illusions. Drinking 50 grams Juice of cotton tree leaves mixed with 100 grams of rice socked water cures poison spread by rat bite. Crush red cotton boll, Filter it’s juice. Take 20 grams of the juice 2 to 3 times a day. This works as an antidote for any poison ingested. Finely Grind together cotton tree leaves and mustered seeds. Apply this mix immediately on the area bitten by scorpion. This cures soon. Crush cotton flowers and extract the juice. Apply this juice on burnt wounds as an ointment. It gradually heals the wounds. Boil the crushed baby cotton leaves in castor oil or with cow ghee. Apply this on joints and bandage it. This gradually removes joint pains. Crush cotton leaves and extract it’s juice. Apply this on the swollen area of the leg to cure. Boil cotton leaves in butter milk. Apply these leaves on the eyes and bandage them to get relief from eye pains. Deep Fry some cotton seeds in a vessel till they turn black. This can be used to massage the teeth to get rid of bacteria and give healthy teeth. Crush cotton tree leaves and extract juice from them. Apply this on mumps to cure. Make juice from cotton “boll” and filter it. Add some guggilam (Myrsinaceae) and honey to the juice. Put 2 to 3 drops to remove puss from the ear. Crush cotton leaves and obtain 30 grams of juice. Add 30 grams of candy sugar powder to this. Drink this twice a day to cure.